Leo is as active as any toddler ever was, he runs, he jumps, skips, rolls and boy can he scoot. 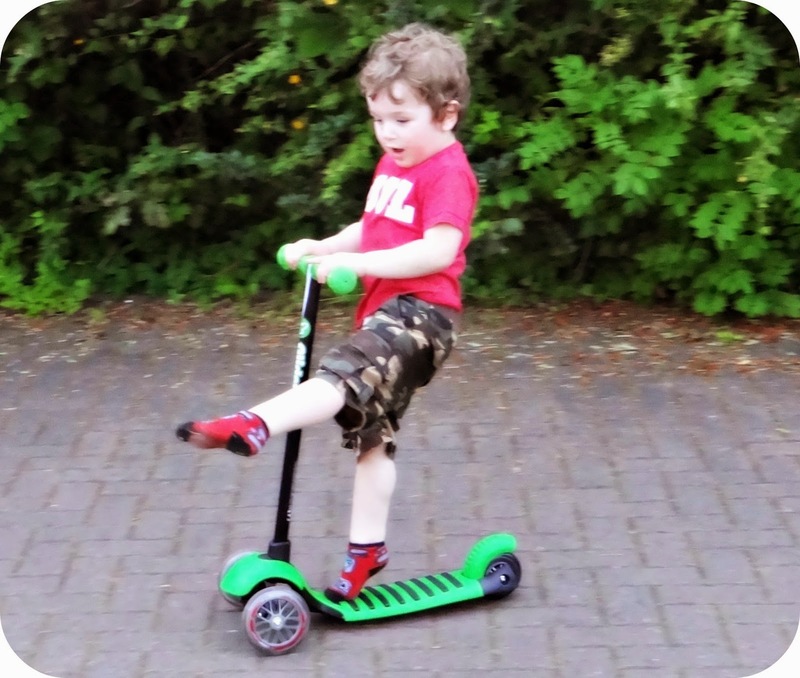 Leo learnt to scoot last July just after he turned 2 and since then he has come on in leaps and bounds. He builds up speed in the blink of an eye and he can balance himself so that he can turn corners with ease, not to mention the speed in which he hurtles around them. It has been amazing watching Leo come along so far with his scooting and there is no denying how much fun he has while he is outside playing. 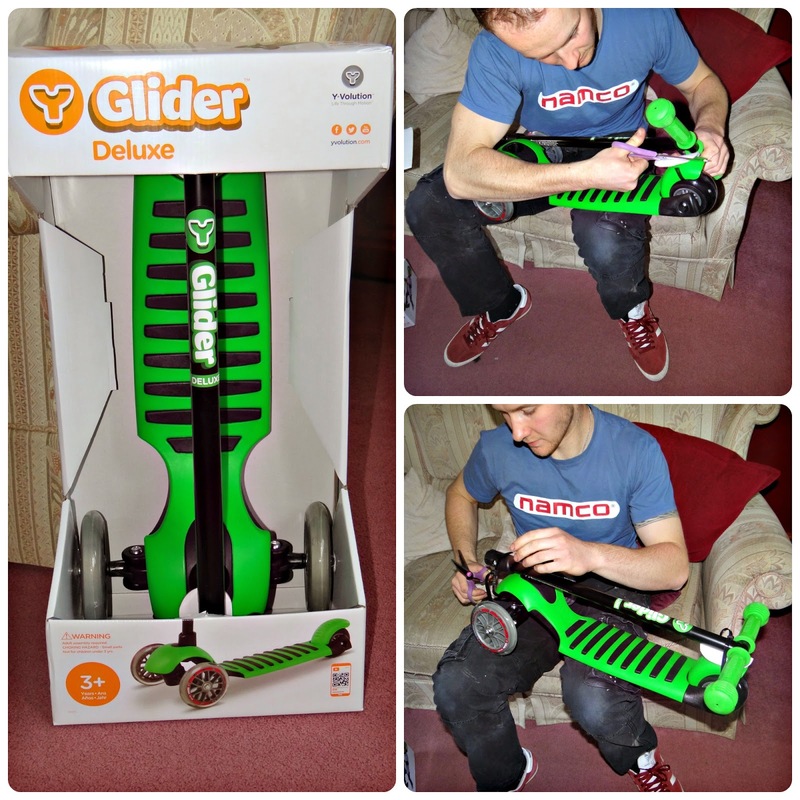 Leo was recently sent the Y Glider Deluxe from Y-Volution to put through its paces, and he was so excited when he saw the box with a shiny new scooter for him to play with. Daddy was tasked with putting it together and it simply involved installing the handle bar into the scooter deck. It wasn’t even a 5 minute job, it really was as simple as that. With the scooter ready for action Leo wasted no time in getting outside. As soon as the Y Glider was out the door Leo hopped on and sped away, the unique steering mechanism allowed Leo to navigate the driveway perfectly. He was weaving around my parked car and scooting circles around me (As per usual…) and showing me he knew exactly what he was doing. Along with Leo, Daddy was also scooting on his Y-Volution Fliker Carver, seeing both my boys enjoying themselves was so lovely to watch. The Y Glider Deluxe is suitable for toddlers 3 years and over, Leo is not quite 3 yet and he has been enjoying it for the last few weeks. 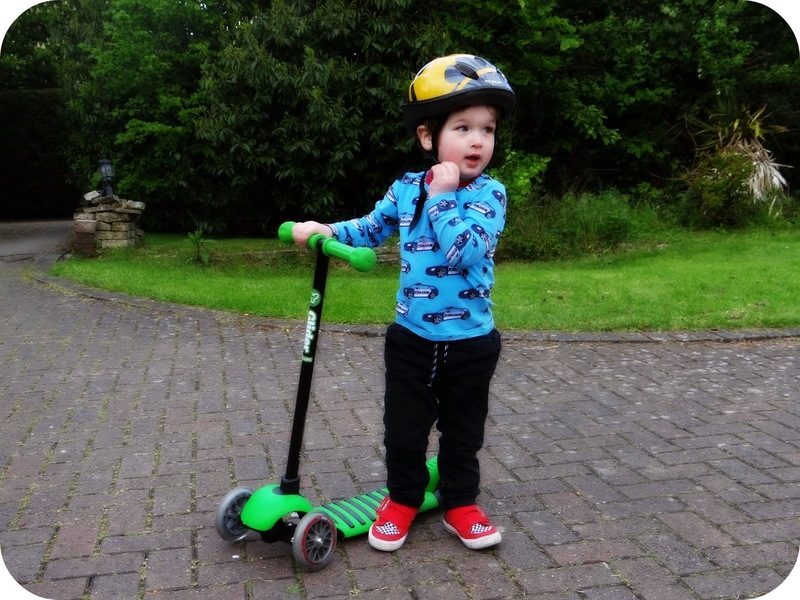 I think you know when your little one would be ready, but Y-Volution do actually have a first scooter that is suitable for kids aged 1 through to 5, The Y Glider 3in1. 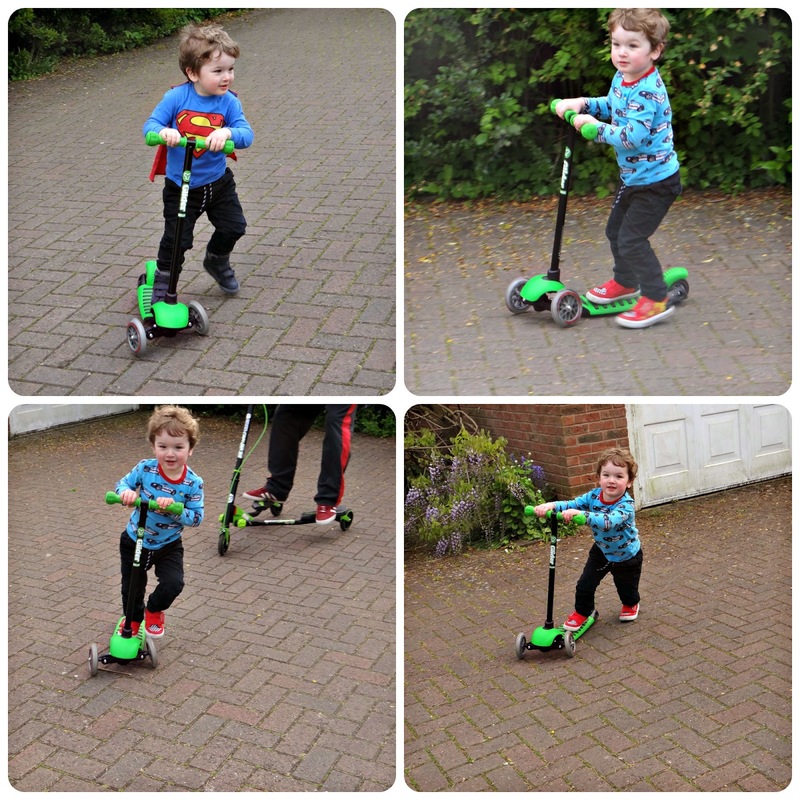 Leo has been really enjoying the Y Glider Deluxe and I have been really impressed with the design of the scooter. The steering mechanism is really responsive, so when Leo wants to change direction he can do it effortlessly. I think when picking out a child’s scooter you do need to look at how they steer and handle, you do want something that is going to work for your little one and this is where I really rate the Y Glider. Leo is getting to an age now that I think is a transition between being a toddler and being a little boy. We still use a pushchair on our travels primarily because he gets tired and I’ll either end up carrying or, having a mental breakdown from him ‘looking’ with his hands in every shop we enter.. But there have been occasions recently where Leo has been scooting into nursery, and I think when Leo does finally wave bye bye to the pushchair days, he will be trading one set of wheels in for another. It is such a convenient way for Leo to travel around, it gives him his own independence and allows him to have fun all at the same time. The other week when I let Leo scoot to the park he was so well behaved, he scooted along and listened to everything I said to him. He never went too far ahead, he stepped off the scooter and held my hand when it came to crossing the road and he was just really well behaved. I guess when we do start to give our little ones that little bit of extra freedom, we need to know that they will keep their eyes and ears open ready to take commands. It really is a sign that they are growing up. Leo is even starting to use the brake on his new Y Glider, he scoots along and pops his foot back to put the brake on to slow down. 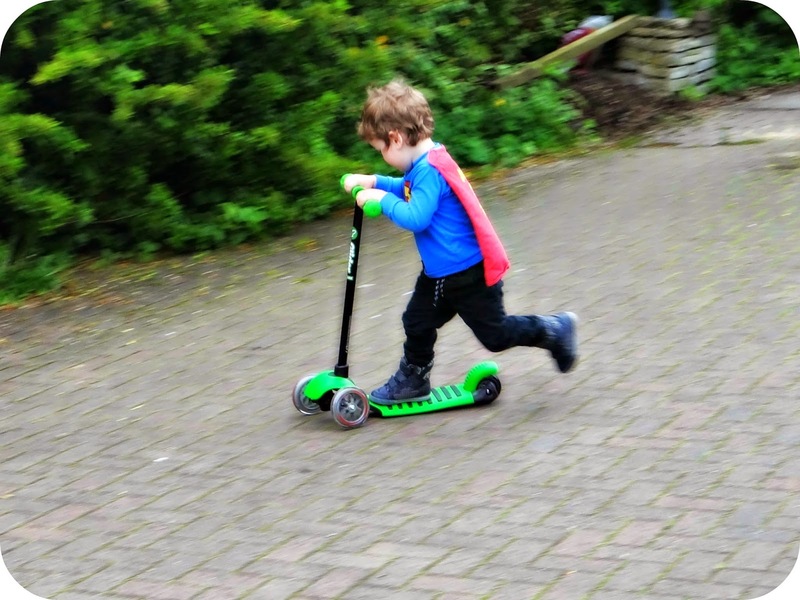 He is just oozing confidence as he scoots around like he owns the place, and in his scooting he is learning lessons all of the time. Scooting is helping Leo learn about balance, he knows if he wants to go right then he has to lean right and vice versa. Scooting is helping Leo to develop his co-ordination and motor skills, and watching Leo scoot shows me that all of this is happening. The Y-Volution Y Glider Deluxe is a great little scooter, and retailing at £39.99 it doesn't break the bank either. We are hopefully heading to the seaside in June and I get the feeling the Y Glider will be coming along too. 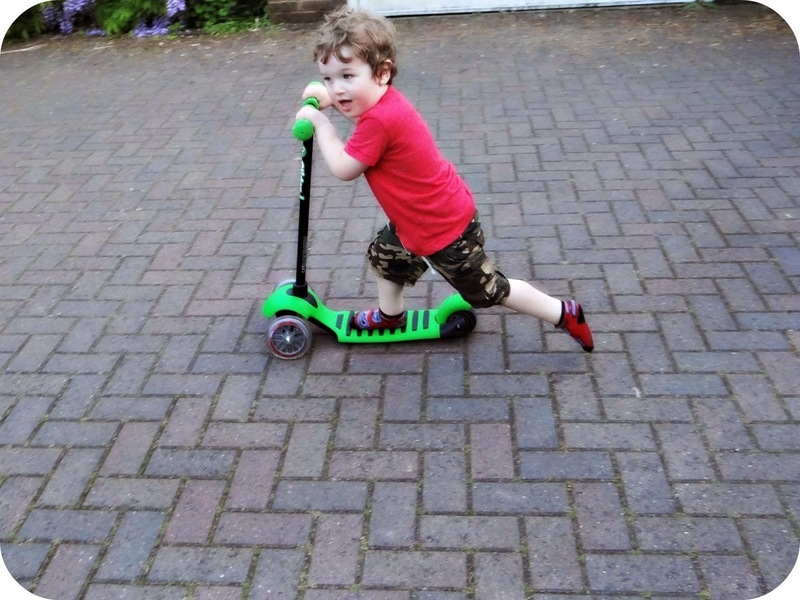 Here is my little man in action, scooting around with his Daddy on the Y-Volution Fliker Carver. Disclaimer: We were sent the Y-Volution Y Glider Deluxe for the purpose of this review. All views and opinions expressed are completely honest and my own. LOVE scooters, none of mine have been very good at bike riding, although we have the Micro Scooters. This looks fab!